In the Austin-shot Six Pack Sam, the titular serial killer with a predilection for female college students is captured in secret and subjected to experimentation by a scientist with an unknown agenda. Six Pack Sam’s only surviving victim, though, vows to track him down to uncover the truth behind her police detective father’s apparent suicide. The cast features Leviticus Wolfe as Six Pack Sam, Darcel Danielle as his surviving victim Jessa, and Diana Rose (Kopy Kings, Ya Albi) as the mysterious Dr. Campbell. Six Pack Sam will screen 4 p.m. June 10 at the Alamo South Lamar. The chiller represents writer/director Joe McReynolds’ follow up to 2010’s The Vern: A One Hit Wonder Story. 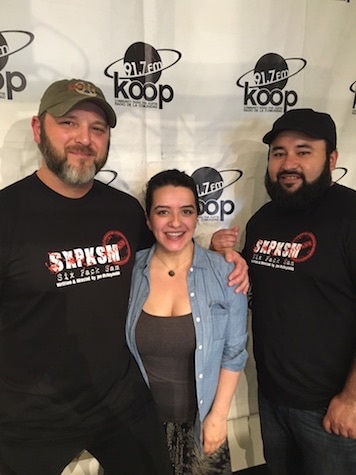 Writer/director Joe McReynolds (left) and Diana Rose (center) join director of photography Javier Garcia (right) during this interview.